This game not endorsed by Pele. While Pele's Soccer may have broken new ground in the field of celebratory fireworks, it certainly didn't do much for video soccer. 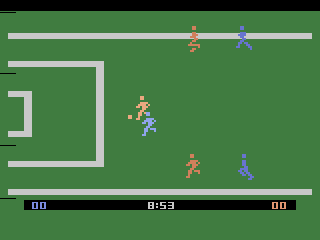 An overhead view representation of soccer with small blobs for players didn't help sell the 2600 as a sports system, in fact feeble early attempts like Pele's Soccer actually turned many sports fans to the Intellivision instead. Atari needed to get sports fans back to the 2600 and fast! Thus the RealSports line of games was created. While most sports games used small players on a large screen to sense of perspective, RS Soccer went with large characters on a normal sized screen. 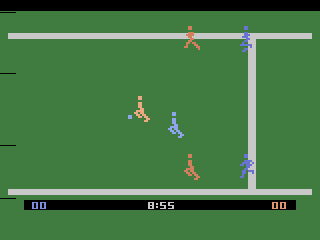 To create a proper sized playfield, Atari used scrolling techniques to create the illusion of the player running down a large field (one of the first games to do so). 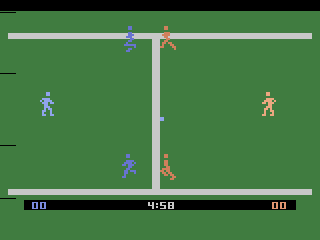 Atari also created the "wraparound" feature where the characters wrap around from one edge of the screen to the other (unless they have control the ball of course). So if your character goes off the right side of the screen he will reappear on the left edge of the screen. This may sound a bit strange, but it works well once you get used to it and can be used to set up some interesting passing plays. As in most early sports games, you can only control one player at a time. 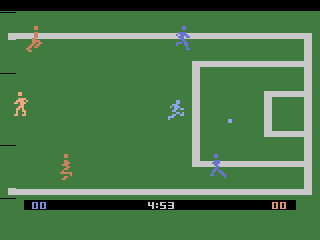 The computer takes control of your other two teammates, and will attempt to make the appropriate decisions to keep the ball in play. This is where RS Soccer begins to fall apart, the computer AI is fairly limited and it's easy to beat the computer using the same plays over and over again. Had the AI been beefed up a bit, it would have added alot to the game. Because of this, RS Soccer is best played with two players. Strangely, two versions of RS Soccer exist. The PAL version and the 1987 re-release have a few small changes in the gameplay. There is no start-up tune when the game is turned on, the "ping" sound when a player takes control of the ball is missing, and the difficulty switches seem to have no effect (disabling the wraparound feature). Why would Atari take out these features? No one knows. While it may not have won any awards for realistic soccer simulation, RS Soccer is still easy to learn and lots of fun. Because of this, RS Soccer appeals to more than just sports fans and even non-soccer playing gamers can find themselves sitting down for a few periods of play. 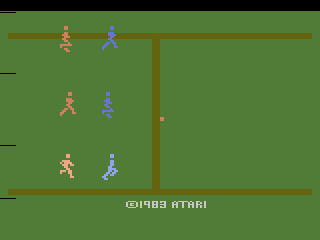 It may have had its flaws, but RS Soccer was a definite improvement over Pele's Soccer, and is one of the better sports titles on the 2600. 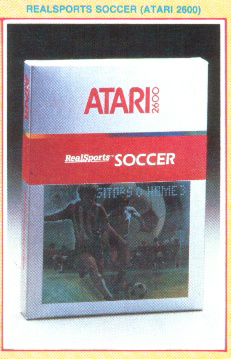 Interestingly an early version of the RS Soccer box was shown in catalogs featuring different artwork. This artwork was eventually used for the 5200 version.